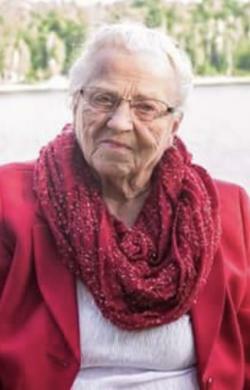 The passing of Hattie Victoria (Cooke) Russell, wife of the late Reginald Garfield Cooke, occurred peacefully with her family by her side at Collingwood Rest Home, Pennfield NB on January 14, 2019. Born in Carleton County NB on June 24, 1923, she was a daughter of the late Roy and Florence (MacDonald) Stoddard. Hattie is survived by her children: Florence (Ralph) Drost of Lepreau NB, Margaret (Doug) Carr of Tay Creek NB, Rowena (Ivan) Upham of Apohaqui NB and Ross (Eva) Cooke of Utopia NB; step-children: Ellen Davis, Billy (Doreen) Russell, Doug (Sandy) Russell all of St. Stephen NB and Marjorie McLaughlin of Saint John NB; 15 grandchildren; 38 great-grandchildren; 10 great-great-grandchildren; sisters: Ruby Cooke of Norton NB, Gladys Cooke of St. Stephen NB, Nadine White of St. George NB and Geraldine (Herb) Disher of Chamcook NB; one brother: Lewis Stoddard of Chamcook NB; many nieces, nephews and cousins. In addition to her parents and her husband Reginald, Hattie was predeceased by her second husband: William Russell; daughter: Pearl Hunter; two grandsons: Rodney Sharpe and Christopher Drost; sisters: Juanita Lloyd and Royetta Hatt; brother: Linwood Stoddard. Hattie spent her life devoted to everyone else. Hattie held many jobs, from caring for others at a young age to being a lobster fisherman with her husband Reginald, back in the day when traps were pulled by hand. She also worked for Connor's Bros. and found herself rowing daily from Bliss' Island to Connors Bros. in Blacks Harbour and back to Bliss' Island, where she prepared the meals for her family in the evening and tended to her family. Her and her husband Reginald also operated a grocery store, "Cooke's Grocery" at Pennfield Corner for approximately eight years. Following the operation of the store and with her husband's health began to fail, Hattie had to become the sole bread winner. In the late 60's during the construction of the number one highway, she went to work as a cook for North Shore Construction of several years and then to Grove Construction. Besides being a cook, Hattie held different positions within the companies including weighing trucks. She also baked several items which were for sale at various stores throughout the area. When Collingwood Special Care Home was purchased by her grandson Danny, she went to work for several years caring for the residents. Hattie never fully retired and she always found herself doing something in her later years, such as repairing beautiful quilts for Global Textile. Faith and family was extremely important to Hattie and her caring heart and compassionate soul will be sadly missed by all who knew her. Arrangements in the care of the St. George Funeral Home (755-3533) 26 Portage Street, St. George NB. Resting at the funeral home chapel on Wednesday from 2-4 and 7-9 pm. The service will take place at the Royal Canadian Legion Branch #40, St. George NB on Thursday at 3:00 pm. A visitation prior to the service will be held at the Legion beginning at 1:30 pm for anyone who would like to attend. The interment will be held at the St. George Rural Cemetery in the spring. In Hattie's memory, donations to Charlotte County Cancer or to a charity of the donor's choice would be appreciated by the family.